Masolino da Panicale, also known as Tommaso di Cristoforo Fini is best know for works in collaboration with Masaccio (1401 – 1428), such as their Madonna and Child with St. Anne, also known as Sant'Anna Metterza, a painting executed for the Church of Sant’Ambrogio and now in the Uffizi Gallery. He is also known for his frescos in the Brancacci Chapel in the Church of Santa Maria del Carmine in Florence, The Temptation of Adam and Eve. The Virgin and Child, with its powerful volume and solid possession of space by means of an assured structure through perspective, is one of the earliest works credited to Masaccio. 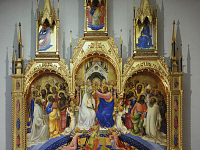 The depiction of the angels, delicate in their tender forms and pale, gentle colouring are from the more Gothic brush of Masolino; except the angel in the upper right-hand reveals the hand of Masaccio. The figure of St. Anne is much worn and hence to be judged with difficulty, but may well be an invention of Masolino. The figure of Christ is that of a young child, a realistic presence, rather than a gothic cherub. This is also one of the first paintings to display the effect of true natural light on the figure; it is this invention which imparts the modeling of form so characteristic of Masaccio, and which would have a profound influence on the painting of the Italian Renaissance. Also in the Uffizi Gallery is Masolino’s, Madonna of Humility.